Picot (p) — Chain 3, work a Sl st in first chain worked (furthest chain from hook). Make a magic ring (or as an alternative, ch 4 and join to form a ring). Round 1: Ch 4 (counts as dc + ch 1), *1 dc in ring, ch 1, repeat from * 6 more times, join with a Sl st in 3rd ch of beginning ch 4 — 8 dc and 8 ch-1 sps. Round 2: Ch 6 (counts as dc + ch 3), *1 dc in next dc, ch 3, repeat from * 6 more times, join with a Sl st in 3rd ch of beginning ch 6 — 8 dc and 8 ch-3 sps. Round 3: Ch 8 (counts as dc + ch 5), *1 dc in next dc, ch 5, repeat from * 6 more times, join with a Sl st in 3rd ch of beginning ch 8 — 8 dc and 8 ch-5 sps. Round 4: Ch 10 (counts as dc + ch 7), *1 dc in next dc, ch 7, repeat from * 6 more times, join with a Sl st in 3rd ch of beginning ch 10 — 8 dc and 8 ch-8 sps. Round 5: Ch 12 (counts as dc + ch 9), *1 dc in next dc, ch 9, repeat from * 6 more times, join with a Sl st in 3rd ch of beginning ch 12 — 8 dc and 8 ch-9 sps. Round 6: Work 1 Sl st in same ch as join and each of the next 5 ch, p, work 1 Sl st in each of the next 4 ch, *1 Sl st in next dc and each of the next 5 ch, p, 1 Sl st in each of the next 4 ch, repeat from * 6 more times, join with a Sl st in first st of round — 8 dc and 8 ch-9 sps. 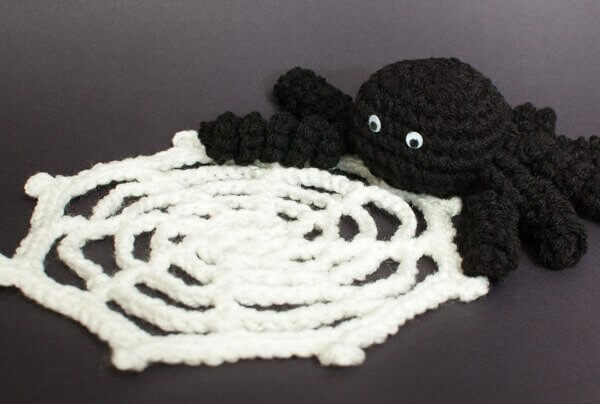 Thanks, I made mine with crochet cotton and it came out wonderful. I have made a Halloween diorama for my granddaughter and it will make a great addition. I love that! So adorable! This is very cute! Thanks for sharing! 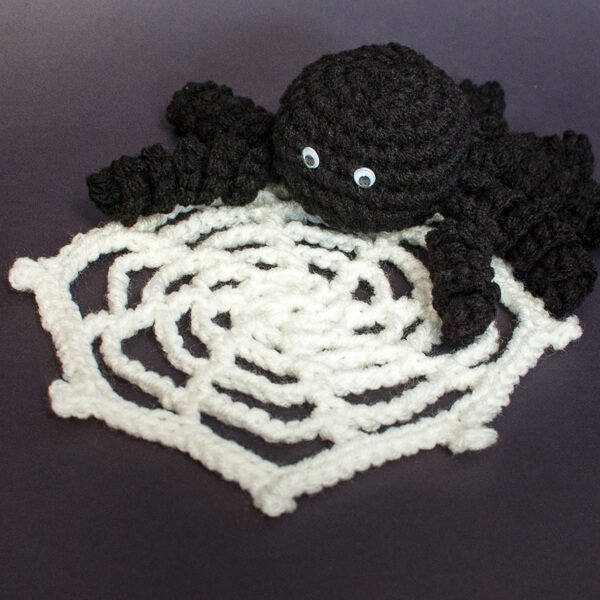 Oh, the web is such a cute addition to your adorable spider! This is so cute! I love both the spider and the web!